You must make reservations at least 5 minutes in advance of the time at Vincent on Camelback. If you plan on hosting a small intimate gathering in your home or a large themed event at a special location, Vincent’s catering can make your party planning effortless and create an event that is truly memorable for your guests. Our full-service catering department can coordinate every aspect of an unforgettable experience with exceptional food, wine and service, fresh flowers, specialty rentals, themed decorations and entertainment, and even valet service. We’ve worked on hundreds of events from intimate parties with five guests, to large events for more than 1,000. Nationally acclaimed for extraordinary food and fine wines, Vincent’s on Camelback can accommodate private groups and gatherings from 10 to 125 in one of our several private dining rooms. Let Vincent’s plan your entire special event from individualized menus to creative centerpieces to special giveaways. Vincent Guerithault, chef/owner of Vincent on Camelback, is considered by many to be Phoenix"s culinary prize. 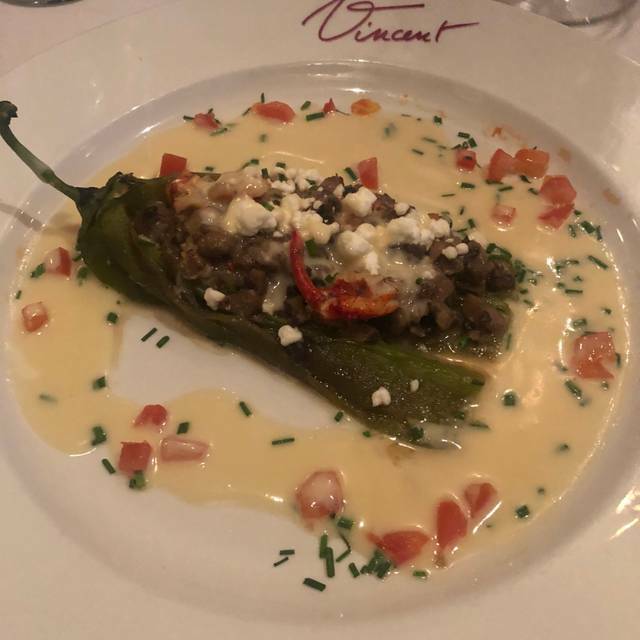 For almost 30 years, Vincent has been combining his expertise in classic French cooking with Southwestern ingredients to create a unique blend of flavors that has become his signature. His style is constantly evolving. Critics note that his food is always "intriguing and inspiring." Patrons say it's sumptuous. Vincent was the first chef ever to receive a Citation of Excellence from the International Food & Wine Society. He has enjoyed countless commendations, including the James Beard award as "America's Best Chef: Southwest" and the prestigious Chevalier de L'Ordre du Merite Agricole on behalf of the Republic of France. In 2003 Vincent's on Camelback was placed 24th on the World's Top 50 Restaurants by British based Restaurant Magazine. Zagat has ranked his restaurant "most popular" and "best in area." We look forward to welcoming you to Vincent's! We went for the Easter Brunch. As always our meal was wonderful & the serving outstanding & friendly. So, this is my first opportunity to visit Vincents. Not knowing what to expect, I was eager to find out if this restaurant was a true gem in the Scottsdale/Phoenix area. Let me assure you that it was indeed. While the food was superb, the service was exceptional. From the time that we drove up, everyone that greeted us and served us and did their very best to do nothing but please us. What an incredible wine list. I had the Dover sole/halibut combination And she had the rack of lamb. Unbelievably well prepared and beautifully served - perfect. We followed with a mixed berry tart cobbler. This was the perfect ending to a perfect meal. I heartily recommend Vincent’s When in the area and based on my experience, you can be assured of a memorable evening. 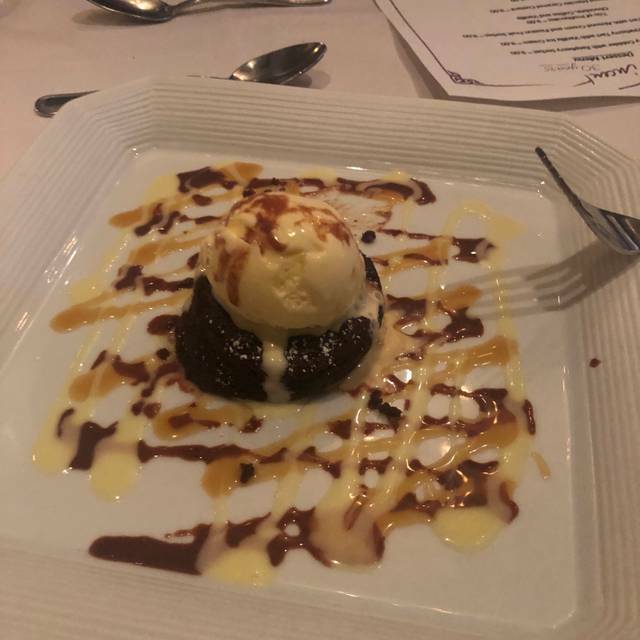 The entire experience was OUTSTANDING, from the excellent service to the delicious food. I make it a point to dine with Vincent's whenever we visit Phoenix. Still the best restaurant in metropolitan Phoenix. Started going there in the ‘80s. Honestly, one of the best dining experiences I have ever had in the Phoenix area. 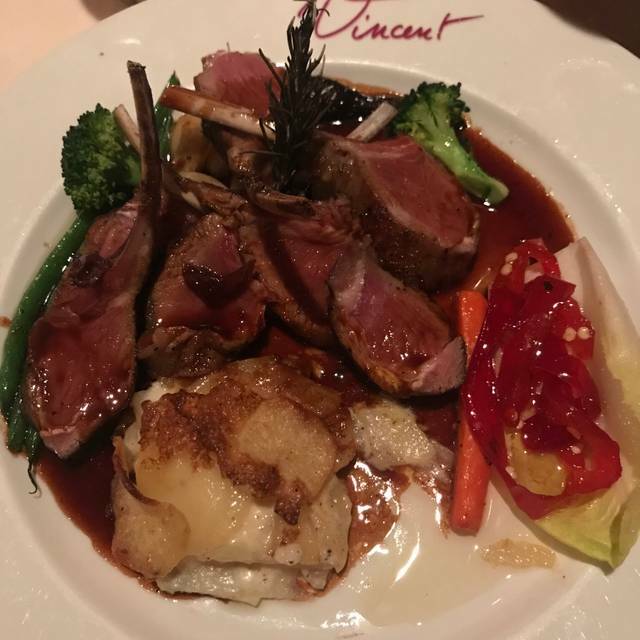 Vincent’s on Camelback offers superior French cuisine, and friendly, professional, attentive staff. The wine list is incredible. I will be coming back. The food was amazing. I was last there nearly 30 years ago and was very much looking forward to returning. 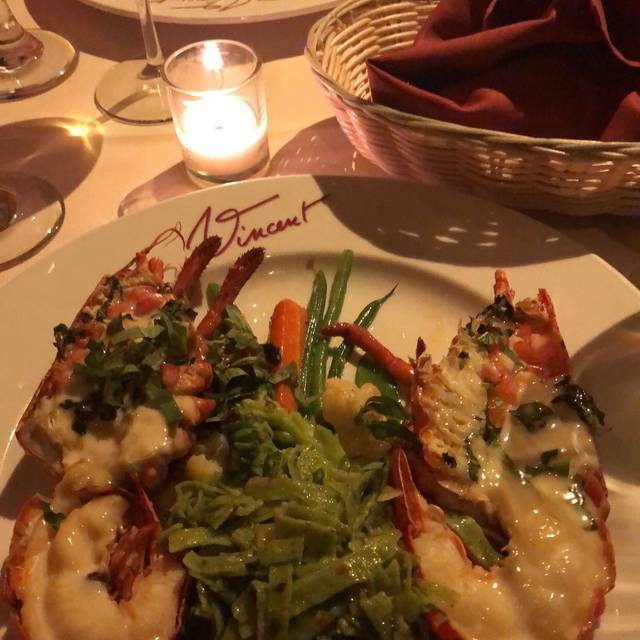 Vincent’s was everything I remembered and more, excellent food and service you won’t be disappointed. We had a great time, however my wife had a GI problem early in the morning and then all the next day. I ate the same food and had no reaction at all. We think maybe the food was too rich for her. The service was terrific! We were there for our anniversary. The food was great and the service top notch. This was our first time at Vincent and we WILL BE BACK. Had such an amazing experience. Our waiter was so very knowledgeable on their extensive wine list as well as where their food came from and how it was prepared. This was our anniversary and they made us feel so very special. The food was out of this world. This restaurant has been here for over 30 years and it's a hidden gem in Phoenix!!! Go check it out, you won't be disappointed. Restaurant is long overdue for a renovation. Was seated in a small burgundy colored room with a folding partition separating our table from the kitchen traffic. The room itself was unexceptional in ambiance, a joint with white table cloths as opposed to a fine upscale restaurant. Have dined here on several occasions in a much better seating area. This was a very special occasion for us and I was extremely disappointed in the setting. It made us feel over dressed. A good place for foodies but there are better options in the valley if you are also desiring ambiance along with fine cuisine and excellent service. Quaint French restaurant off out of the main areas on camelback. Second time eating there. I would DEFINITELY come back. We split the lobster cake. One claw inside each cake. Sauce was good, little salad included had a good flavour. Had the duck for my entree and my wife had the elk chef special ($48). Dessert was ice cream coffee and vanilla great tasting when I added an espresso. Drinks martinis were fabulous. The bar tender knew his stuff. It is great to meet someone passionate about his job. Overall wonderful experience. Wait staff was top notch. Paid attention to detail and made the experience great. Awesome place !! Chef Vincent was there to greet guests as well. Nice personal touch. 3 couples had a great evening of food and conversation. Food was superb. Service was outstanding! Highly recommend Vincents. Everything was incredible. Macadamia crusted Scallops and the Duck were fantastic! Brilliant fusion of southwest & classic French cooking. The best restaurant in the country west of the Mississippi. 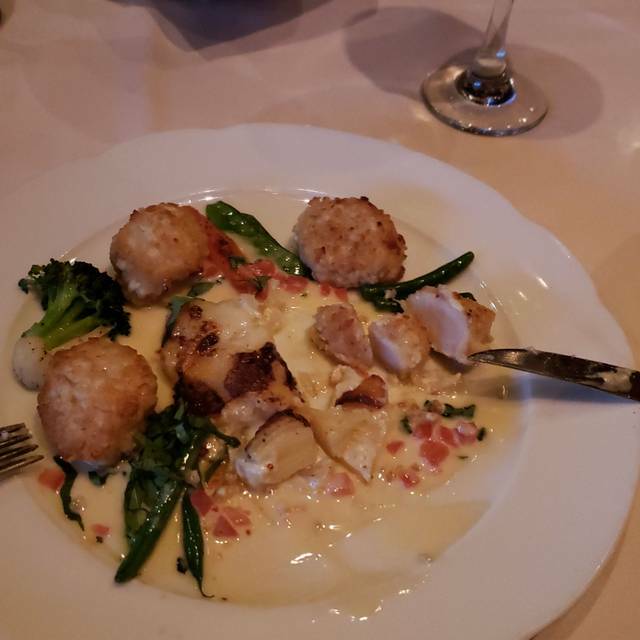 We first visited Vincent's in 1998 and have been back several times over the years. 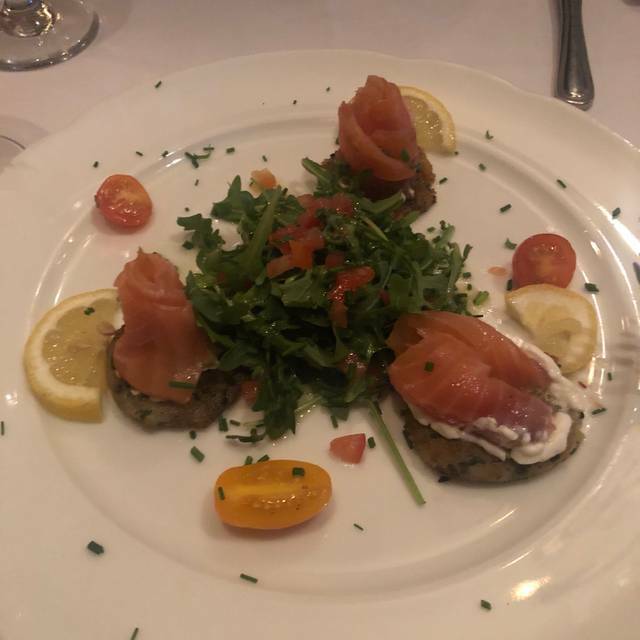 We have observed two things, the menu seems to have less of a southwestern influence and more of a French theme and the restaurant itself is looking tired.Having said that the food was excellent, great wine list and the service was very good. Outstanding food, duck tamale appetizers, special salad, root veg soup, dover sole, all exquisite and very tasty! Howard our waiter took very good care us.best restaurant visited during our trip to Phoenix. Old style restaurant with quiet atmosphere. We were visiting from the East Coast and thought it was amazing - the entire experience. We have friends who travel to Scottsdale often, and we recommended Vincent on Camelback to them and they are going to go! Thank you! Vincent hit on all cylinders. Exception food, very noteworthy wine list, great service. When most common restaurants on Open Table get a 4-5, there needs to be a new category for this level of quality. Vincent was a 5+ on that select scale. We have had the good fortune to eat in the top restaurants around the country - with this in mind, this was a very special dinner. We were treated like royalty. Vincent always shows us a culinary delight! Thank you for the wonderful family dinner. Vincent continues to excel in quality and flavor. Our advance requested sweetbreads were mouthwatering as were the other starters and the lobster salad we ordered. They even whipped up a meyer lemon soufflé for us since the special lemons are in season. It's small and intimate so not a place for your group or a boisterous evening. It remains one of our special favorites in the valley. 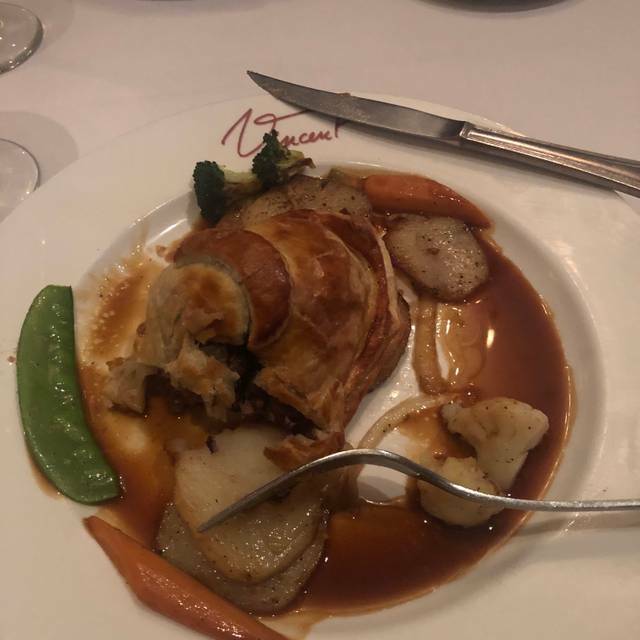 Been eating at Vincent's since the early 1980's.It continues to be for us one of the Top Restaurants in the Phoenix area. You can expect a truly Gourmet experience every time ! Vincent's lived up to the hype. I now know why it's been around for so long and so highly regarded. The Foie Gras, Lamb, Veal, Scallops, Duck Confit, Pecan Pie and flourless molten chocolate cake were knock-outs. Just go ahead and make the reservation, you won't be disappointed. Everything was amazing. One of the best meals my wife and I have ever had. The Anaheim Chile stuffed w mushrooms and lobster w goat cheese was incredible. Not spicy just perfect. Lastly our entrees macadamia nut encrusted scallops and the Dover Sole we’re fabulous!!! The best food we have had in the Phoenix/Scottsdale area. in the last two months. We were on a mission to try as many restaurants as possible. We visited over 20. The evenings salad special was fantastic, I had the duck, my husband had the veal. Subtle flavors, cooked to perfection. The only off note was the two Cabernets I tried by the glass were disappointing. The chocolate flourless desert was the perfect ending to a great meal. When we return to the area next year we will definitely be back. This is my all time favorite restaurant in the Phoenix area. Vincent and staff never disappoint. Great food, great place, great chef. Fabulous restaurant for a romantic unique dinner! Service was impeccable! My wife and I decided to try Vincent's as a new fancy date night experience. The ambiance at the place was nice (France meets Italy), fairly quiet (esp for a Sat night), though the tables were very small and cramped. We started with the Maine Lobster salad, which was fantastic and the highlight of the meal. We then had the Maine Lobster with Basil Pasta dish which was displayed nicely but was average on taste (very plain with a very small lobster). We finished our meal with the biggest disappointment of the evening the creme brulee. 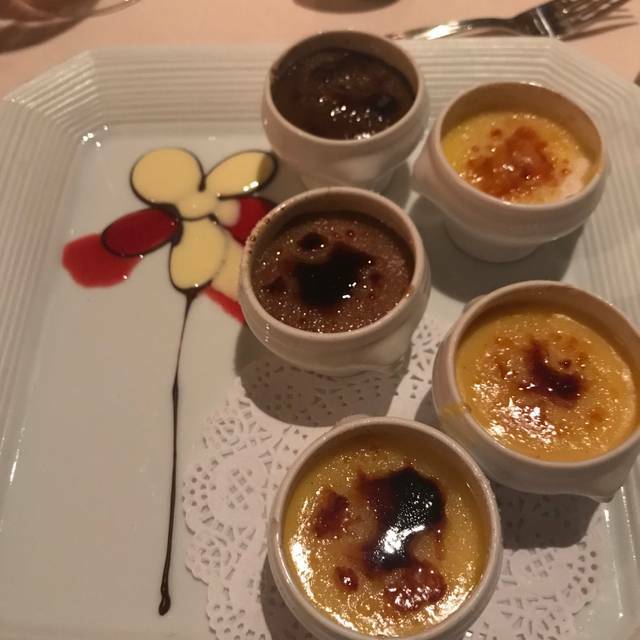 There were several flavors of creme brulee of which I doubt a single one was cooked thoroughly with all of them inconsistent in flavor (sweet at top with taste of liquor at bottom) and a grainy texture. Overall, I thought it was an average experience but at that price point, I would suggest Lon's at the Hermosa or Different Pointe of View. Vincent's is among our favorite fine dining restaurants anywhere. Superb food, great wine selection, ideal service, beautiful semi-private spaces. Don't miss Vincent's! Food was mediocrity and service was poor. I won't go back. I am out of state and didn't know better. Even valet service is poor. In preparation for a trip to Phoenix with friends from Napa, (we're from Chicago) I was responsible for a reservation for Valentine's Day dinner. I saw Vincent's while searching the internet and the pictures reminded me of a trip to Provence. I booked a table on the decor alone. What a fabulous experience awaited us! We were early for our reservation and were shown into a charming room were the French hostess offered us a glass of champaign and delightful conversation. Our table was intimate, and quiet. The service was attentive, our waiter charming. Our meals, elk, Beef Wellington and sole, were outstanding. 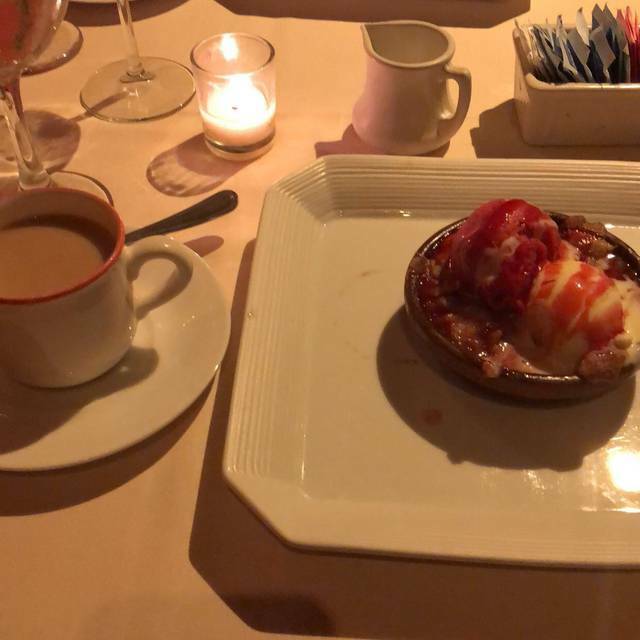 Our friend from Napa is still talking about his Grand Marnier soufflé. We plan on returning to Vincent's before we leave, certainly a highlight of our trip. Awful Valentines dinner. Our server, G, was CONSUMED by trying to rush all of his tables as quickly as possible. We had an early table as we made reservation about 2 weeks before, not early enough for a prime time table. We and the other 2 tables G was serving were never offered the wine list, we had to ask and so did another of his tables. This held up everything as we did not want our entrees or even our starter to arrive before a sip of wine. Nevertheless, G would be by every 2 minutes asking and asking and asking if we were yet ready to order. Again, no thank you, still waiting for the wine. This was to the amusement of 2 darling people sitting next to us that commiserated with us quite humorously. The people next to us had a different server whom offered them the wine list WITH the dinner menu. She was a much more efficient and pleasant server. G needs a vacation. Excellent as always. Scallops a bit overwhelmed by the macadamia crust. Rack of lamb was rare to medium rare though medium was requested. Still very fine dining for a special occasion. Outstanding food and service. So good!